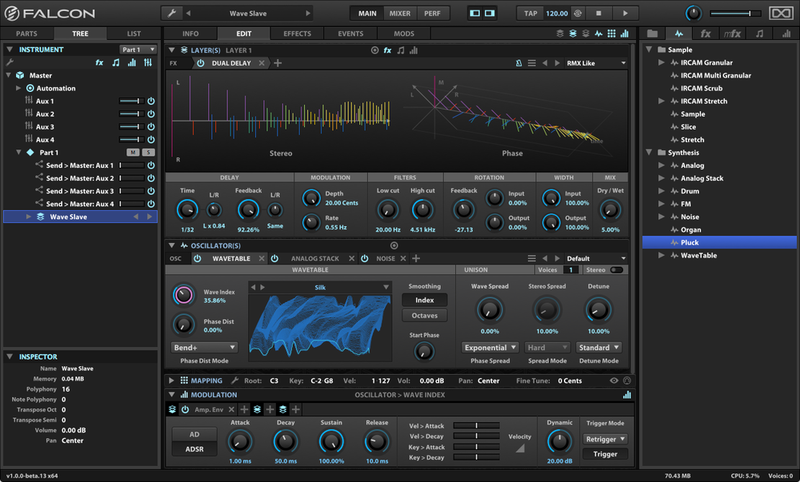 French audio developers UVI have announced a brand new virtual instrument named Falcon. This fully-featured hybrid instrument sports 15 oscillators covering various synthesis and sampling techniques, over 80 effects, extensive modulation control and more, and it’s available now at an introductory price of $229, until November 9, 2015. Falcon is clearly a hybrid instrument by design, allowing unrestricted use and layering of oscillators, effects, modulation generators and event processors. From advanced time-stretching and granular sample engines by the renowned Parisian IRCAM institute to pure synthesis oscillators like Wavetable, FM, VA, Drum and the Pluck physical modelling oscillator, Falcon provides tools for near infinite sound and instrument design potential, say its makers. 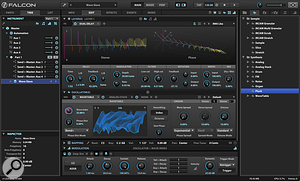 Falcon interface handles both basic tasks and deep instrument design, allowing users to easily slice a sample across your keyboard, add effects globally or per note, drag-and-drop modulations and sub-modulations or grab one of the many script processors to creatively tune, modify or sequence your patterns. Parameters can be mapped as macros and easily controlled by MIDI, OSC or host automation and even arranged as custom control panels through a built-in visual editor. Advanced users can take instrument design further with scripting. Create custom script processors to generate or modify MIDI data or even design fully-skinned instruments with the Lua language. Falcon offers native 64-bit operation in stand-alone and plug-in formats, supports surround setups up to 10.2 channels, is compatible with all UVI powered soundbanks, and allows simultaneous authorisation on up to 3 computers or iLok keys. Falcon is available immediately at an introductory price of $229 through November 9th, 2015 (regularly $349) from authorised dealers and the UVI online shop. A free $100 voucher is included with every Falcon license, good towards any soundbank at uvi.net (valid for 2 months from time of purchase).